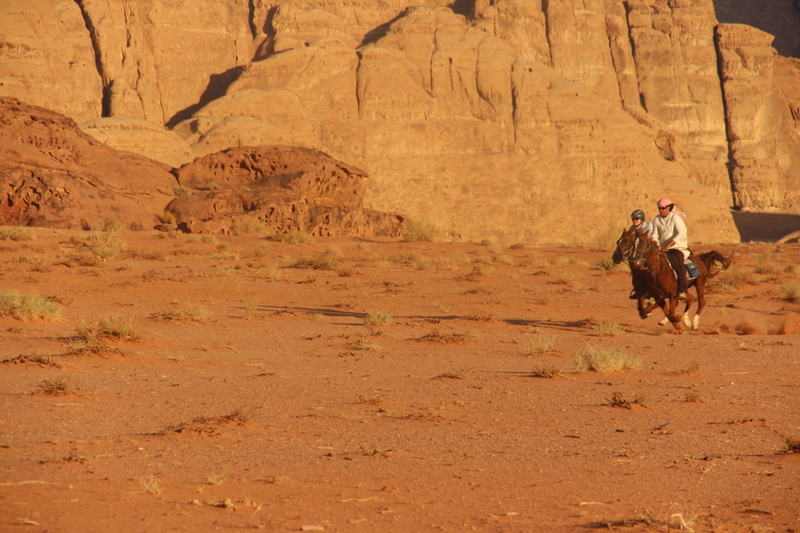 Horse riding in the Wadi Rum desert. 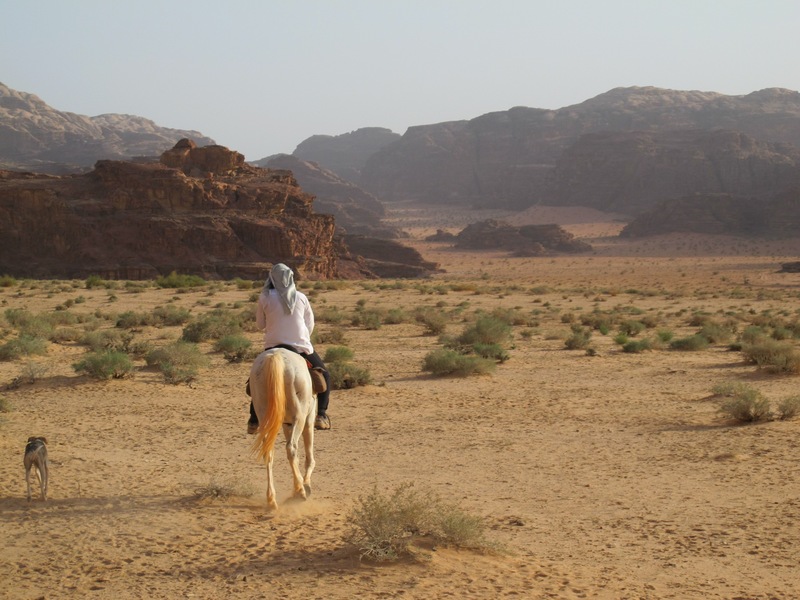 6 days horse riding in Wadi Rum desert. Riding level : This activity requires you to be experienced in horse riding and fit enough to enjoy and take advantage of the ride. Also, as our horses are Arabian, they are small and can not carry heavy weight. We do not ask them to carry more than 85 kg. What is an experienced rider? to know how to saddle and unsaddle your horse. to know to control your horse at all paces in open area. to know how to do rising trot, canter and gallop. Meeting at our stables/in Rum village at around 9.00 am. Time to drink the first bedouin tea, meet the horses and the team. First ride through Um Ishrin valley, on the way visit of Lawrence’s house. After lunch we will ride through an open valley with a view over the red sand area. Dinner and bivouac in Abu Hassaran. After breakfast, we will cross Rash Rasha valley with its red sands and go to Qatar mountain. There we will see the spring and have lunch. After lunch, ride to Um Raza, its red sands and its canyons, where we will set up camp for the night. After breakfast, we will ride to Arab Antar, a natural cave famous for its legends. Lunch near Arab Antar, then we will go to Sweibat valley, that is located 5 km from the saudian border. Dinner and bivouac in Sweibat. After breakfast, we will cross through Cerdan valley and see a Neolithic well that is still used by the Bedouins. We will have lunch in Um Umgur. Then we will cross narrow canyons to arrive in Abu Rashaba where we will set up camp for the night. After breakfast, we will ride from Abu Rashaba to Jebel Burdah and see the natural rock bridge on its summit. 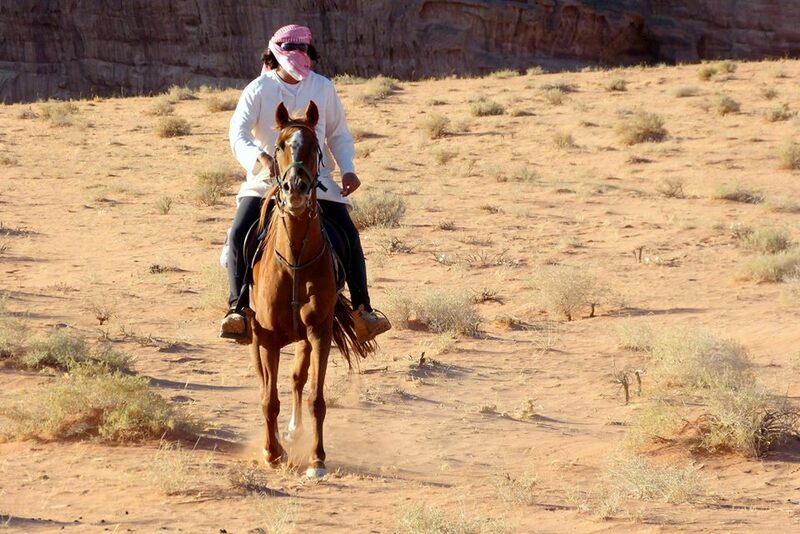 After lunch we will ride to the red sand dunes and Jebel Um Feshiyeh and its nabatean inscriptions. Dinner and bivouac in the red sand dunes area. After breakfast, we will cross Barragh canyon, that is le longest canyon in Wadi Rum, having a look at its monumental cliffs, famous for rock climbing. Then we will cross the Disseh plain to go back to our stable. Lunch in the stable. Consult us for booking conditions. 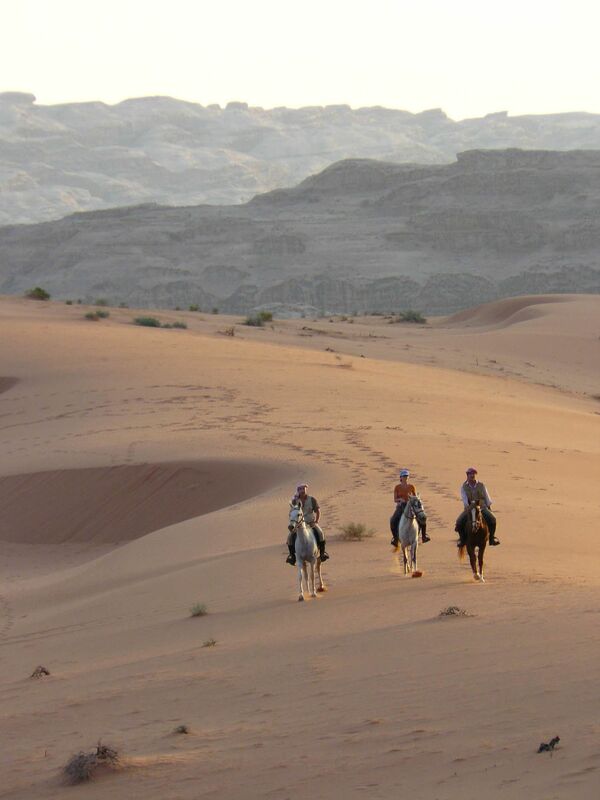 Guided horse riding trail in Wadi rum full board. Camping equipment during the trail. Jordanian visa ( 40 JD at Amman airport). We set up our bivouac camp in a different area each night, carefully selected for the season and the beautiful landscape. Your dinner is freshly cooked and we will dine around the camp fire each evening. We provide two-person bivouac (trekking) tents and mattresses, or if you wish you can sleep outside under the stars. Single tents are available for an extra charge, and occasionally in winter we will move to our fixed camp. Your luggage is transported for you by jeep, and especially for the horse riding tour we provide a “bathroom tent” with warm water where you can wash.you a desert experience with its silence and its charm. For confirmed departures and dates, please contact us at bookings@jordantracks.com and we will be pleased to send you all the informations you need about your itinerary, accommodation, transfers and how to make your booking.